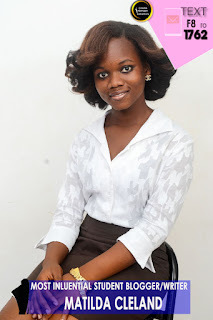 she was previously the Women's Commissioner for her department and also a member of the previous administration ( 2014/2015) Women Commission Committee of the SRC, not forgetting also a blogger, the sole administrator of www.matildacleland.blogspot.com, has been nominated in the most anticipated tertiary awards to hit the country, the Ghana Tertiary Awards. 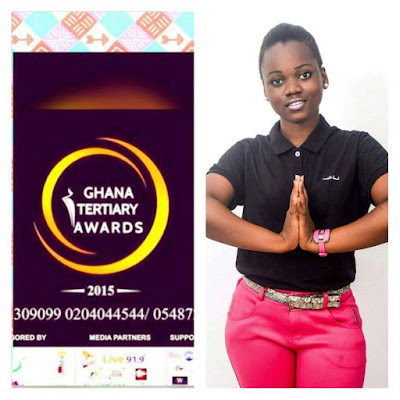 The event, scheduled for the 6th of November 2015 aims at awarding Ghana's most influential students across the country, for which the young lady battles out in the category of the Most influential Student Blogger of the year. Aside these, she was crowned 2nd runner up for Miss Teen International Ghana in 2011. Hoping to be a tv and radio presenter soon too, She's also a low key designer, actress, chorister, promoter, artiste manager and writer, call her "the Jill of many trades" as she is almost good in every bit pf the things shes lays her hands on, there's no doubt that there's a bit of "Influence" in her blood. To vote for Matilda (Tilly) to win the award in her category, Text [F8] to the short code 1762 on all networks. We counting on your support and kind gesture to help her win and like they say "...Amosa's support Amosa" so the Aggrey Memorials show the love. Thank you!